As technology continues to advance at a faster rate than our own brains and maturity levels, it is now a common occurrence to lose a conversation to a personal electronic device. Whether it’s a smartphone, tablet or computer, we now all know what it feels like to talk to someone who isn’t listening because they’re too absorbed in their next big app or some other sort of virtual communication. So, what happens to all the old devices as they’re continually replaced by the next hot model—especially around the holidays when such items make popular gifts. Well, they get tossed like any other refuse. What was once a fixture in your everyday life instantly and continually becomes yesterday’s trash, and that is the subject of the latest hot-button environmental issue: e-waste. So, what problems do vast amounts of e-waste generate besides finding enough space to discard it all? 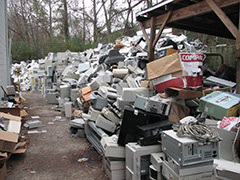 In addition to squandering loads of recycling potential, discarded electronics often end up releasing a lot of their toxic metals into the environment. These materials should be kept out of incinerators and landfills to avoid spreading. Unsurprisingly, cell phones account for the largest amount of used electronics. Therefore, they’re responsible for one of the largest contributions of toxic metals as well as the biggest cause for bad etiquette. Posted on January 2nd under Pollution Reduction.